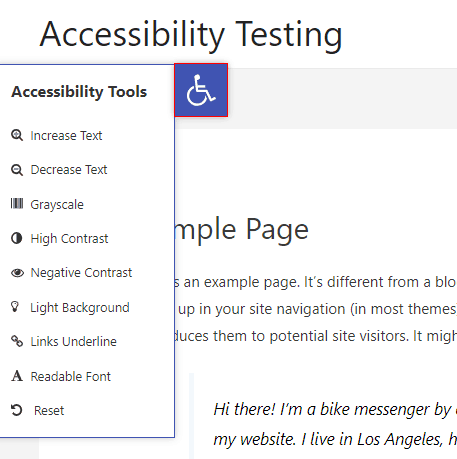 In this post, I want to look at a free plugin for WordPress that helps to make your website more accessible for people with disabilities. Website accessibility is important because these days we are living our lives more and more online and we want everyone to be able to participate and use our website. I host a website for a local non-profit and in the past I’ve used a text resizer plugin on that site to make it easier to increase the size of the text, but that was pretty limited and it keeps going out of date. 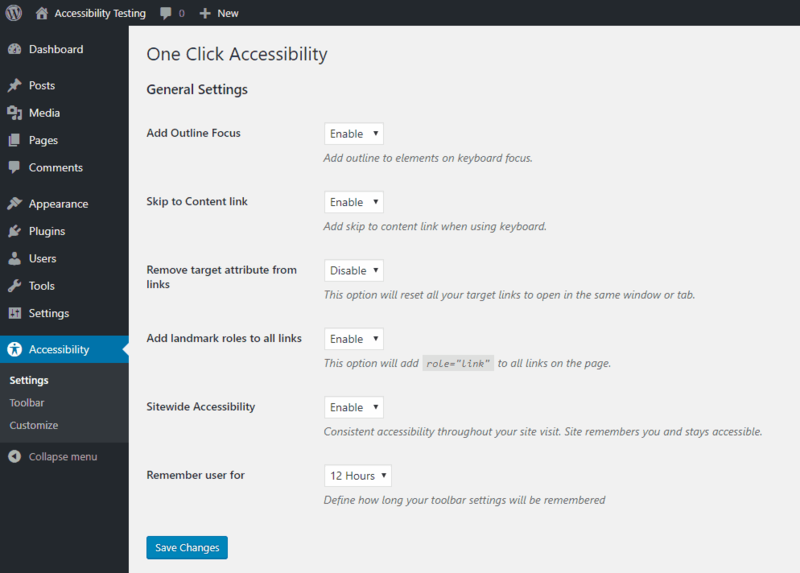 I recently tried several of the accessibility plugins in the WordPress directory and was pleased with this one, “One Click Accessibility,” which was the best of the ones I tried. 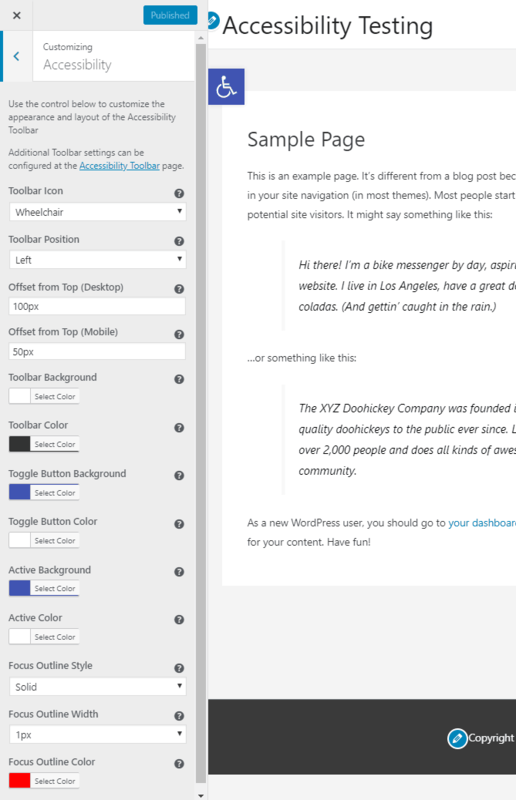 The plugin is easy to setup and use and it increases the accessibility of your site. This plugin is created by the Elementor team. It is totally free and it has some nice features. You download it from the WordPress plugin directory. The plugin was originally created to go with themes that the Elementor company created, but was later rewritten to work with all themes. There are a few one star reviews that are two years old. from the time before the rewrite, but there has obviously been a lot of work and care put into the project and the recent reviews have been positive. The plugin is currently used on about 10,000 sites. You install the plugin the same way you do other plugins from the WordPress.org directory. Click “Add New” and type in “One Click Accessibility” and select the plugin from the results. When you install it, you get another admin menu item. On the “Settings” menu there are general options. These include enabling an outline focus to elements selected via the keyboard to make it easier to track keyboard navigation, adding a skip link to content when using the keyboard, making links open in the same window, and adding the “role” attribute to links. The “Toolbar” menu item is where you set the features and labels that will show on the widget on the front-end. Here I have a demo site, using the free Astra theme, with the plugin installed and enabled. You can see that it puts a button on the side of the page. Clicking on the button opens a slide-out menu with the options we configured on the admin side. Among other things, you can increase the text size, apply contrasts, underline the links on the page, and force a more readable font. Already, with these features, this plugin is as good or better than the other ones I tried, but there is another very nice addition. If you go into the theme Customizer, there is an area for Accessibility where you can set a number of styling options. In the Customizer, you can change the icon button, set which side of the page you want the icon button to show, set the offset from the top of the page for the icon button, and change a number of color and style options. These are really nice touches. The One Click Accessibility plugin is an easy to use plugin that brings a lot to the table and makes it easy for you to add accessibility options to your site. It has some basic features but also has a good deal of flexibility and a number of styling options.